So, I haven’t written a new blog in a while! Why, You ask?….Because I have been incredibly busy! You guys, I have been so blessed in my new endeavor. Now this is the “busy” season for family photographers, but I am as busy right now as I can be without loosing my mind. This makes me excited for when Kevin and I are ready for me to cut back on hours in the clinic because I really think I can grow my photography business and be successful. This year has been an incredible year of growth. Seeing my images from a year ago, who am I kidding….even 6 months ago, I can see an amazing difference in the quality. My “style” is continuing to fine tune itself and I am so much more confident than I was even 3 months ago! I still come across session situations that are “firsts” for me, but each challenge brings growth and more confidence. This brings me a session-first that happened the other day. My first time shooting a session in the rain. But Brittnay, didn’t you check the weather before? Well of course I did! However, mother nature here in Charleston, South Carolina is a little temperamental. She often says one thing, but then on a whim decides to do something different! One bad thing about being a lifestyle photographer in the low country is being at Mother Nature’s mercy. As a lifestyle photographer, I am all about outdoor locations and natural light. And when Mother Nature is in one of her moods, it doesn’t mesh too well with what I am trying to accomplish. So the day started off beautiful. Sun shining and comfortable temperatures. My clients were my awesome coworker Stacy and her husband James. Stacy and James are about to be parents to a new baby girl and I can not be more excited for them. Poppy Monroe has been in the making for a long time and she is so tremendously loved already. 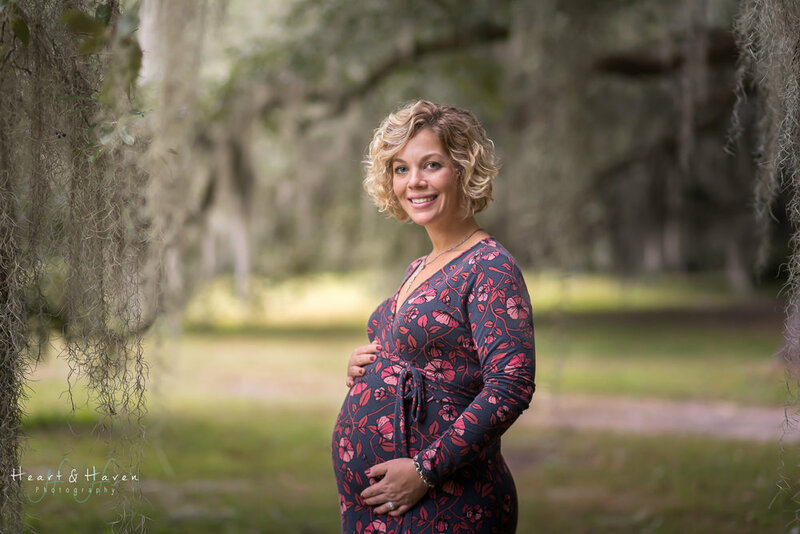 Stacy and I planned her maternity portrait session at a gorgeous park in town called Charles Towne Landing. The park closes at five o’clock so we planned to shoot as late as we could to get at least a little bit of that golden hour light. About midday, the clouds started rolling in. Even that was not a big deal, because the weather man on TV and the weather app on my phone said that we had nothing to worry about because the rain was going to hold off until after sunset. I was a little disappointed that we would have mostly cloudy skies, but I was cool with the clouds as long as it didn’t rain. It’s funny because six months ago, I would have been relieved that it was cloudy. Why you ask? Light from cloudy skies is very flat and even. It’s boring. But it’s easy. 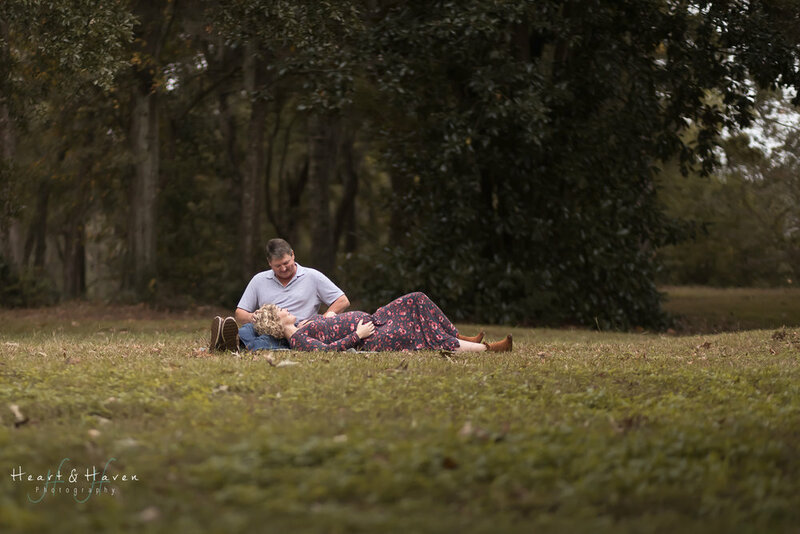 You don’t have to worry about positioning your subjects quite as much to avoid harsh shadows, hot spots, or dappled light. Now, I am disappointed when there is cloudy skies because I’m not afraid of a little light! I have learned from my past sessions and I have fun with light now. I like experimenting with it and I am not intimidated by it like I once was! Ok…back to the session. We paid our fee to get in and as we were leaving the visitor’s center, the ever-slightest drizzle started. I literally had not shot one image inside of the park. Stacy and James did not seem to mind, as they reassured me that they had seen the same weather prediction as I had. So we just went with it! At times, it was just a slight drizzle. Other times, it was a pretty steady light rain. I didn’t have any rain gear for my camera so I had to keep it wrapped up in a blanket in between shots. I happened to have a cute clear umbrella that I had purchased a while back and we used it during the shoot which was fun. Everyone knows the saying, when life gives you lemons, make lemonade. Well, this was totally true about this day and this session. 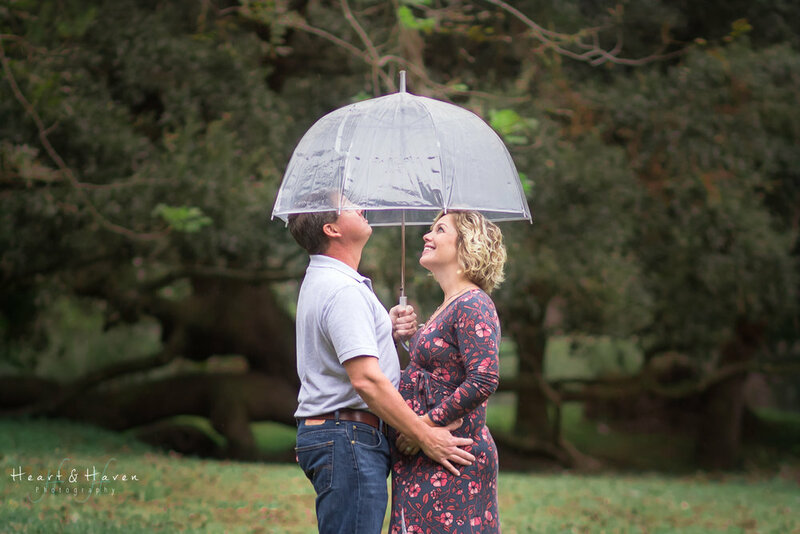 We did not have the best light, and James and I were pretty soaked by the time we made it back to our car (Stacy stayed mostly dry because she used the umbrella which she graciously offered to share, but we declined), but we had fun. We made the best of the conditions we were dealt and got some awesome images in the meantime. Best of all we experienced it together and made some fun memories to share with Poppy when she is older! 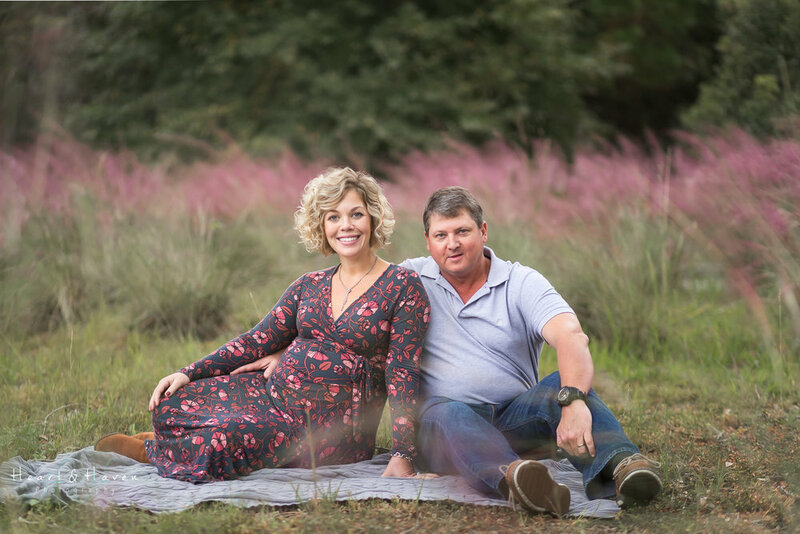 Enjoy some of my favorites from this session of my dear friend Stacy and her husband James! I’m in love with just about all of them.